Creative advertising - for a targeted audience. Heritage Audi of Salisbury had a significant issue with local awareness. Being a very affluent city located in the rural southeast of Wiltshire, with property prices much higher than average, a large proportion of Salisbury’s population was well within Audi’s target demographic. Yet their competitor dealerships, Jaguar and Mercedes had better-located businesses, with Heritage Audi being located slightly off the beaten track. A new showroom rebuild on the horizon and the likelihood of a reduction in footfall to the business, also meant that an action plan was required swiftly. Red Thread Creative came back to us with a well-considered, well-executed communication plan to significantly increase local awareness of the Salisbury dealership. As a “working agency” for Heritage Audi, it was Red Thread Creative’s responsibility to ensure that “lead agency” marketing collateral was utilized for numerous marketing activities, such as new-model launches, mailshots, large-format posters, local radio and press advertising, each conforming to very strict Audi corporate guidelines. It was evident, however, through many discussions with senior members of the Salisbury team, that the local market was being pretty much ignored in favor of the national ‘platform’. 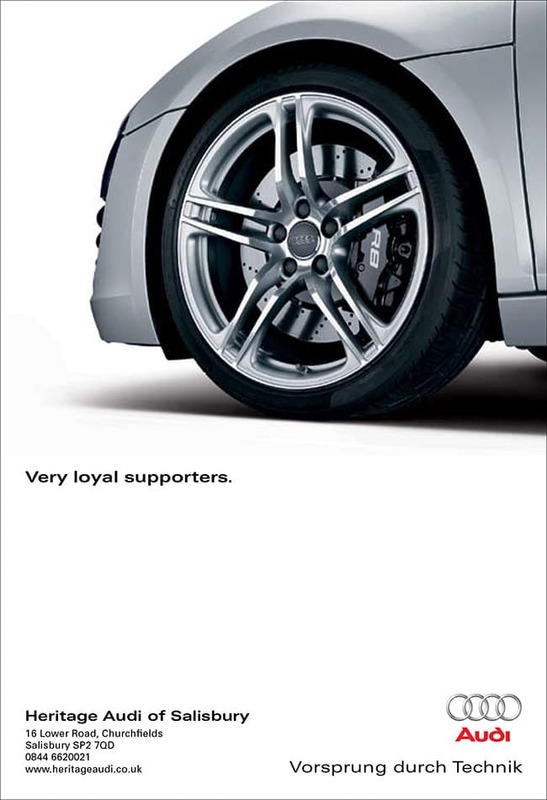 Laurie Baker, then acting Business Manager of Heritage Audi indicated, “although sales are generated through very active, high-level brand awareness national campaigns, as a local dealership we have to consider our local market and what appeals to them if we want to compete more with our local competitors”. Having identified that local business was falling well below the level of their competitors, Red Thread Creative got to work on which Audi brand values Salisbury’s local audience would most associate themselves with. A very interesting Red Thread discovery was that Audi’s local demographic had significant interests in sporting pursuits, which was catered for by a plethora of local enthusiasts’ clubs. Sporting achievements and staying at the top of their game was the link between this local, target demographic and the aspirational values of the Audi brand. Visual communication would not be the issue. 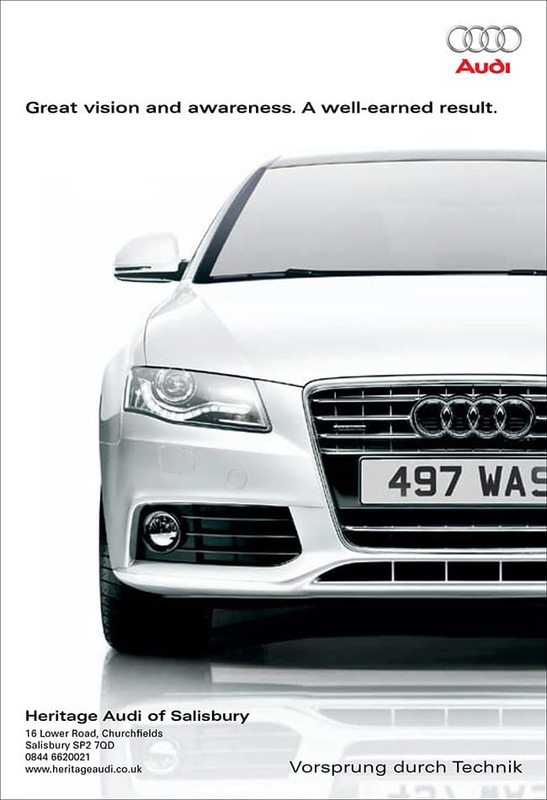 Audi’s distinctive brand and high-quality vehicle photography would compete visually on any marketing platform. The challenge was now, for Red Thread Creative to come up with a stable of advertising ‘messages’ that highlighted the correlation between the pursuit of excellence in Audi vehicles and that of top sportsmen and women. The final approved advertisements would be published in various ‘sports’ publications from regional magazines to local match day programs. The solution to this client issue was in discovering what made their audience tick. As Laurie Baker concluded, “Red Thread Creative came back to us with a well-considered, well-executed communication plan to significantly increase local awareness of the Salisbury dealership”.